A defence consortium made up of Naval Group and Airbus Helicopters has secured a contract to develop technology in the field of rotary-wing drones. France's defence procurement body, Direction Générale de l’Armement (DGA), awarded the contract to designer of Australia's Future Submarines Naval Group and Airbus Helicopters, which will see the two primes delve into de-risking studies ahead of construction of a future tactical helicopter drone demonstrator aboard warships. The demonstration project will lead to trials of the drone launch system, mission system and airborne vehicle, conducted from a French Navy vessel. The VSR700, a 700-kilogram drone system derived from a light civilian helicopter, the Cabri G2, is being developed by Airbus Helicopters with Naval Group working to integrate the drone onto warship systems. The drone system can exceed 10 flight hours of operational autonomy with a payload capacity of up to 150 kilograms. The DGA said the purpose of the contract is to identify, deploy and test the technologies necessary for the integration of a tactical drone-system capacity within a heavily armed vessel. It forms part of the preparation of the SDAM (Navy Airborne Drone System), whose entry into service is foreseen for the middle of the next decade on new Intermediate-Size Frigates (FTIs) and other French Navy ships. It is expected the study will help select the principal technologies for the SDAM and the identification of the technical risks necessary for initiating and realising the program. Naval Group and Airbus Helicopters shall be jointly responsible for the industrial project management and will co-ordinate wider input from French industry. Both companies will act as the program design authority and will have Hélicoptères GUIMBAL, Thales Systèmes Aéroportés, Safran E&S and ONERA as their principal subcontractors. Hervé Guillou, president and CEO of Naval Group, said the contract will see the French company become a world leader in this area of technology. 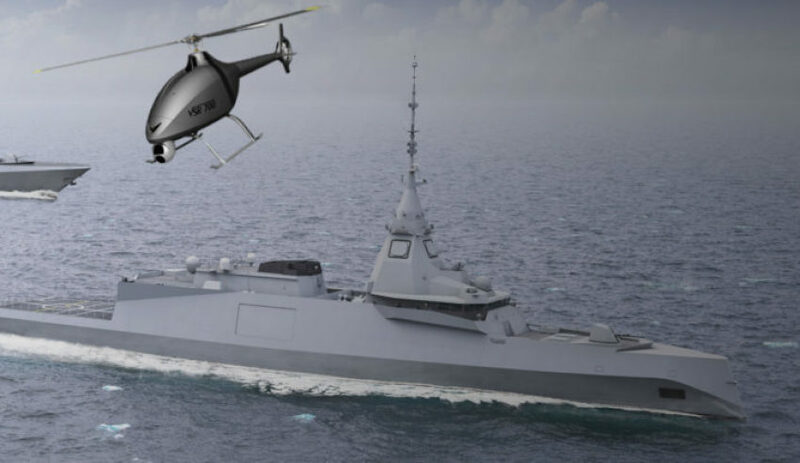 "We are proud to have been selected by the DGA, together with our long-standing partner Airbus Helicopters, to allow the French Navy to integrate aerial drone systems into its units and strengthen its operational capabilities," Guillou said. "This study also allows us to structure a world-leading industrial sector in this field." Naval Group began working on naval integration of aerial drones in 2005, having been awarded several studies contracts to develop this technology, including R&D contract IND, R&D contract D2AD, and Serval.